Chief executive Mark Darbon says Saints will run two separate processes as they seek short and long-term successors for Jim Mallinder. The club called time on Mallinder's 10-year tenure at Franklin's Gardens on Tuesday, stressing the need for change. 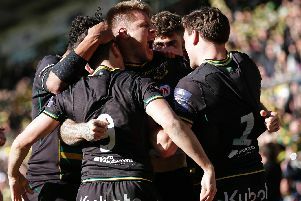 Saints currently sit 10th in the Aviva Premiership and bottom of Champions Cup Pool 2 following a run of nine defeats in their past 10 matches in all competitions. Attack coach Alan Dickens has been placed in temporary charge of the team, with the rest of the coaching setup remaining unchanged for now. Saints will seek a short-term replacement for Mallinder to complement the current coaching structure. And they will also be looking for a long-term replacement, who can help the club to build for the future. "We haven't put a definitive timeline on the recruitment process, but, of course, we'd like to have Jim's (long-term) successor in place as we go into next season," Darbon said. "One of the drivers for making the decision at this point during the season is to run an open search to find a world class director of rugby moving forward. "We may bring in some interim support to create the right conditions for our existing coaches to succeed for the remainder of this season. "But I see the two things as separate. "We want to run a proper process so we can be well set for next season." Former Bath boss Mike Ford has been mentioned as someone who could be drafted in for a short-term role. But Darbon would not comment on individuals and has stressed there are several candidates for the immediate and more long-term future of the club. "A lot of names have been mentioned already and we're right at the start of that process so we're not going to speak in detail about certain names," said Darbon, who started his role as Saints' chief executive at the end of July. "We're focused on bringing someone in who can thrive in the conditions here. "We've got fantastic facilities, a great squad of existing players, some really exciting new players coming in, a massively loyal supporter base and we want someone who can thrive in those conditions and help us deliver on our ambitions for this season and beyond." But will Saints have financial limitations, given the fact they will have had to pay Mallinder compensation as his contract was not due to expire until the summer of 2019? "The incoming person will find this a very interesting proposition and the amount of interest we've had to date is testament to that fact," Darbon said. "We're not alone in facing financial challenges as a club - 11 out of 12 clubs lost money last year. "We're incredibly proud of how we're set up as a PLC and of our record of profitability. "The change we're making here has no bearing on our ability to invest in players and our recent signings are testament to that. "It's a hugely exciting proposition and we're confident we will find the right person."